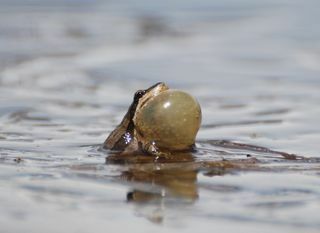 Boreal chorus frog calling in YellowstoneYellowstone is not known for being prime amphibian habitat. Frogs—not unlike myself—prefer a less harsh environment than the endless winter of the Northern Rockies. Within Yellowstone’s borders live only four species of amphibians, which include two species of frogs: the Columbia spotted and the boreal chorus frogs. Despite the shortage of frog species, I’ve experienced enough sightings recently to keep even a frog-o-phile like me happy. The frogs—again like myself—are making the most of this wintry spring and taking advantage of the small doses of sunshine and warm weather. A couple of weeks ago I spent an hour at a small pond near the Canyon junction in the park listening to the almost deafening music of a gathering of boreal chorus frogs. These male frogs, probably newly emerged from hibernation, had arrived at their breeding site and were calling for some female companions. For such a small animal (adults are usually less than two inches) to sing so loudly is remarkable—even more incredible is to witness the frog calling as its body almost doubles in size with the expansion of its throat. Also, in a single minute the frog may give up to twenty calls! Watch this amazing spectacle in the video below. On a run up Old Gardner Road yesterday I was lucky enough to spot a single Columbia spotted frog resting in a small stream. 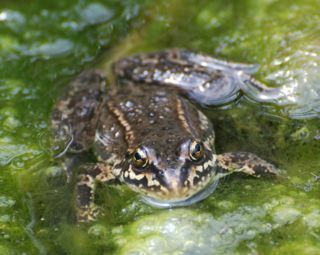 Peterson and Koch write in their book Amphibians & Reptiles of Yellowstone and Grand Teton National Parks that the spotted frog can live up to ten years. Spotted frogs lack the loud, distinctive call of the boreal chorus frog and instead take a softer approach to courtship with a faint croaking.